Introducing the spots of Miyamoto Musashi, the most famous sword master in the world. This trail shows the life of Miyamoto Musashi from the birthplace to the last place where he wrote Gorinnosho. The battle of Sekigahara (関ヶ原の戦い) in 1600 is the most decisive battle happened in the history of Japan. 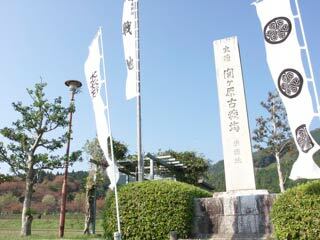 The battle field of Sekigahara is located on the border of Shiga and Gifu prefecture. This battle divided the power of Japan half and decided who was the last winner of Sengoku Period. The result of the battle coursed the fall of Toyotomi clan, and the rise of Tokugawa clan. Right after this battle Tokugawa Ieyasu became the Seii Tai Shogun and open Tokugawa Government at Edo. You can get a map of Sekigahara at the museum. Almost all spots has a parking, and also you can have rental bicycle.